Yelp’s stock dropped in 2018 so in 2019 it is no longer considered among the elite of the elite business directories. That doesn’t discount its value entirely however. while it is not on the same level as Google My Business and Facebook it is still in the next tier of review platforms where customers search for and take stock in, feedback. Yelp has continued to help businesses thrive by using their platform. In many ways Yelp paved the way for the platforms that have now surpassed it. It will always have name recognition but it should no longer be the first priority for roofing contractors. Yelp was once the consensus resource for consumers when searching for a roofer, or business of any kind. So much so, that Yelp was often refereed to as the “review site”. In 2019, target customers are more tech-savvy than ever before. Roofing companies must account for this evolution of thought, and adjust their marketing strategy accordingly. The good news is that business citations can be edited in groups using tools like Whitespark or Yext. Many services that market profile optimization engage in black hat SEO tactics, including the generation of fake reviews. Yelp has seriously cracked down on such behavior, and your company will suffer if it continues to engage in it. 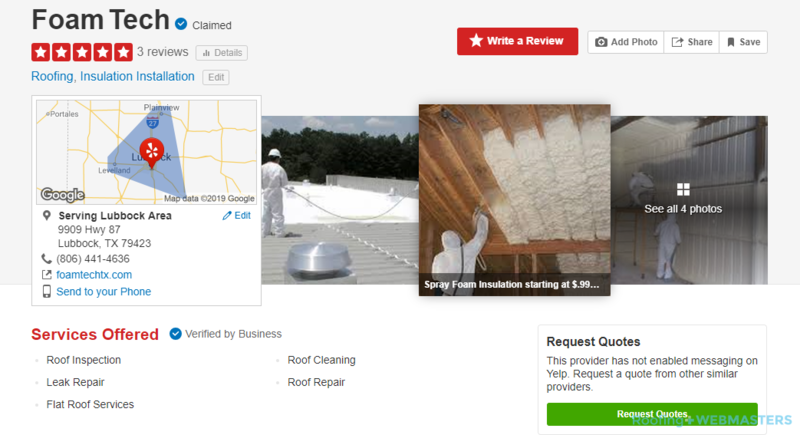 At Roofing Webmasters, we never participate in manipulative tactics, and build reviews only through legitimate means. Our native reviews widget which is installed onto each client website pulls aggregate reviews from external platforms like Yelp and helps customers leave more reviews. Listings should be uniform throughout the world wide web. That means your Yelp listing information should be identical to the corresponding information on Facebook, Google My Business, HomeAdvisor and others. Social profiles also serve as citations, including; Facebook, LinkedIn and Instagram. Ensuring identical representation on each citation source helps boost your local search rankings, and overtake industry competitors. As is the case with any company, negative reviews are part of the business. While you can’t control the publication of bad reviews, you can limit the amount of them by exercising precautions, as well as responding to them professionally. Precautionary measures to take include, ensuring positive interactions with customers, and generating as many reviews as possible from satisfied clients. Responses should always be solution-oriented and paint your company in a professional light. Things to avoid when responding to reviews include; profane language, argumentative tone, and lack of accountability. Remember, it’s not just the distressed customer you are speaking to, it’s every user who visits your review profile and reads the response. Instead of viewing a bad review as a detriment to your company, you can view it as a PR opportunity in which you can highlight the integrity and ethics of your roofing business. Updated on March 25, 2019 at 8:38 pm by Roofing Webmasters.